In our last guide, we explained how an upvote works as a mechanism to distribute tokens from the reward pool each day. Those rewards accumulate in posts / comments and amount to your eventual “payout.” In today’s Toolkit, we’ll explain how to the payout process work from start to finish and what each number means. Each time you click the “Submit a Story” button in preparation of post, you’ll have the option to choose 1 of 3 payout types - Default (50%/50%), Power Up 100%, and Decline Payout. What does each one mean? Decline Payout is just that - declining to take any rewards for the post or comment you made. You'll notice some of the bigger accounts on Steemit (the whales) declining payouts so that they don't drain the daily reward pool. In many cases, it's an announcement / etiquette thing. No matter which option you choose, your post or comment will “pay out” exactly 7 days after initial time of posting. During that time, clicking on the dollar amount will show you the approximate time before payout. When a post is paid out, you’ll see the division between rewards Authors and Curators. 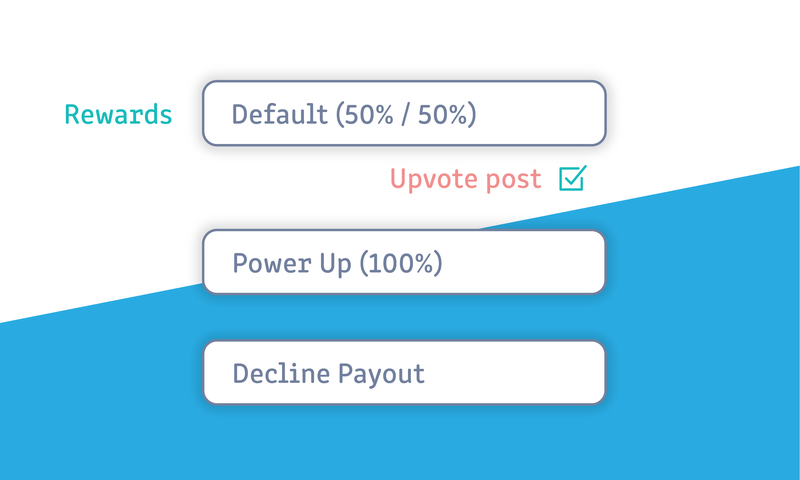 As touched upon briefly in the Upvote Guide, a percentage of payouts are distributed amongs the “curators” that upvoted your post or comment and the majority to your account. The distribution is approximately 75% to the author, 25% to the curator(s). You can read more on the detailed nuances of calculating curation percentages here. After the 7-day period, the payout will appear in your Wallet tab like this. Clicking Redeem Rewards will transfer the amounts to your account. Curation rewards are also redeemed in this way. Yes I remember how confusing it was at the beginning. Your reputation score is rising quickly. Great job! Thanks! I did really well on my first few posts. I love the research you posted, very detailed! @sndox i have been looking for a post like this this couple of days to correctly explain this stuff. I really appreciate. Good luck in the future! This is a great article... I finally understand how this is working better now. So if I am new on Steemit should I use more often: "Power up (100%)" rather than "Default 50% - 50%"? Good to know! Thanks for the information man. Good post thanks....but....do you still get tokens after the 7 day period if people keep upvoting please? wonderfull post u have share a topic related to steemit tools and explained very well i really appreciated you for that and my whole support for you. This is exellent explanation...Thanks from my heart. This is very helpful. I had recently wonder if the payout was based on the average or the price at the time of the payout, in regards to Steem price. So I found that extremely useful knowledge. Thanks for another well laid out, how-to article. We're happy that this post is useful! Like others here, wish I saw this earlier upon starting, :)...another excellent, informative post, thank you. Btw thanks for the info you have shared with us. Such posts will help newbies in understanding the steem environment. Thanks man! What do you recommend in what to invest in, Bitcoin or Ethereum? Really useful post, thank you. I didn't know how this work, so far it just guess work, now I have a clearer understanding of the system. I've already followed you but I'm going to read your other posts. Is there a way to bookmark the post that you want to read in the future? Ok, I thought so. Thanks for the information, I've resteemed for post so I can always go to my blog and check your posts from there. I enjoy getting to know friends on Steemit, please keep in touch. Your article was forwarded to my by my good friend @ibringawareness. I love how simple you made this! Easy to read, fast-paced and it brings the reader the info they need in a straightforward way. You got an upvote and follow. I invite you to visit my vlog and follow if you like the content. Peace, my friend! Oh that's great! Thanks so much @highimpactflix! This is very helpful stuff for all new people....thank you for putting this together. Great detailed explanation..Thank you..going to just power up as i am new. Great post! I'm new and see I have a lot of catching up to do already, so this is this is perfecting timing for me. Thanks! Glad we can be of help. @sndbox This is actually some amazing work!. Does this steemit has to pay money for membership? And i cant see my money in steemit. Where to find it? Hello @keima17! For information on your wallet, check out our dedicated wallet post. Hope this helps! Cheers! I'm still clueless where the money comes from! Oh my gosh I learned something today. Thanks for posting this. Lovely explanation and newbies will find it very useful. What happens if people upvote your content after 7 days? Does this mean that after 7 the day payout, you will not be able to earn any more from that content? I'm a newbie to Steemit and, like the others, I wish I had read this the first day. Today, I transferred some Bitcoins into my Steem account, and then powered up some of them up to Steem Power. This site is certainly not straight forward....there's a lot to learn for sure! Oh my, this is a well-timed post. Just the information I was looking for as I'm just beginning to build up steem. So now I have some new questions: (1) What happens next, after rewards are redeemed? (2) Can a person buy things with Steem tokens, like we might buy something with bitcoins? Lots of other questions too, and I imagine the answers are already waiting for me somewhere. 1- After rewards are redeemed (assuming you chose 50/50), half will be powered up into Steem Power to boost your voting weight while the other half is liquid SBD. You can either convert that into more Steem/Steem Power or send it to an external exchange like Bittrex to have it converted to other crypto. 2- As of yet, Steem is not a "mainstream" crypto like Bitcoin that can be used in marketplaces that use fiat currency. You went the extra mile, thank you! I'm grateful for your answers here. Yeah, it's still a bit fuzzy to me, so I'm thinking I'll search for some posts on each of the subjects I'm questioning, and maybe I can summarize my findings in a way that benefits myself and others too. Your explanations are much appreciated, though, and I feel you're pointing me in the right direction.